Sponsored Post: This post is sponsored by the National Honey Board but the content and opinions expressed here are my own. 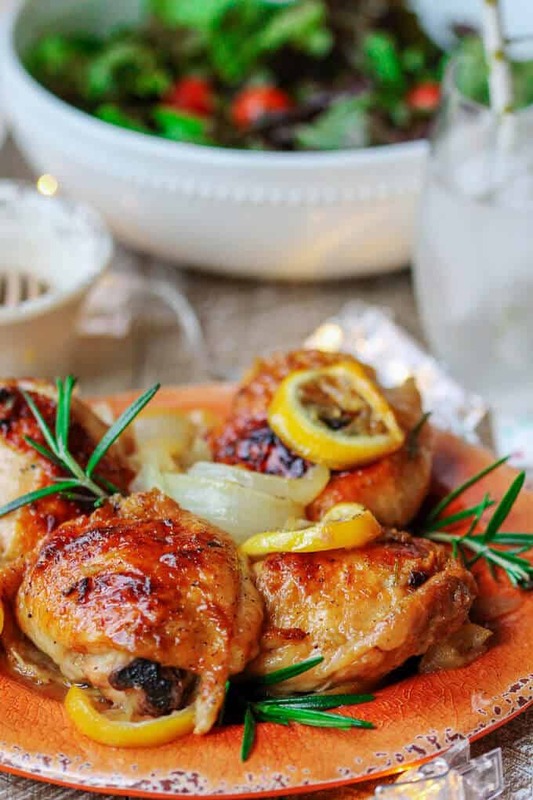 Baked Honey Lemon Chicken with Garlic and Rosemary is a fantastic dish for a date night in. It tastes super delicious and requires minimal preparation…a win-win combination. 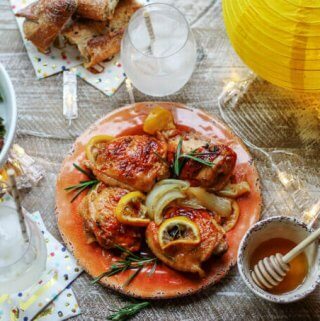 I made this amazing Baked Honey Lemon Chicken with Garlic & Rosemary for an at-home date night. My husband and I have a lot to celebrate this month and I couldn’t be happier to share these golden moments with the National Honey Month. Yes, I’ve always liked September. So many times in my life the best things were happening in September. However, prior to now, I had no idea that September was a National Honey Month, which now makes me like it even more. My birthday is coming in a few days; my husband starts his new, amazing job on my birthday; our eldest son just started Pre-K in a new school, and he is about to start Polish school over the weekend too. So, as you can see, many wonderful things to celebrate! These are the golden moments that we will remember forever and I’m so happy that we can celebrate them with honey. We used to go out a lot, but ever since we became parents of two little boys our date nights out are very rare. We do love date nights out but at this point, they become really difficult for us. Not only we need to pay for a fancy dinner and a babysitter for two kids which gets pretty pricy, but we also need to keep morale high with the boys so they don’t throw a fit when Mommy & Daddy go out. Therefore I really do love to try to spice up our date nights in. The best part is that your date night doesn’t have to involve long lines and overpriced entrees. 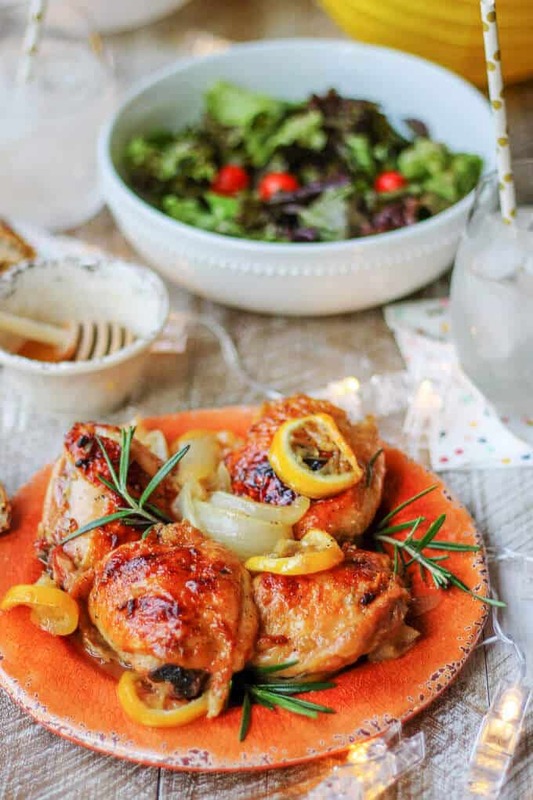 You too can have a great meal like this Baked Honey Lemon Chicken with Garlic & Rosemary right at home. You can also help to make your night a night to remember with some fun decorations. 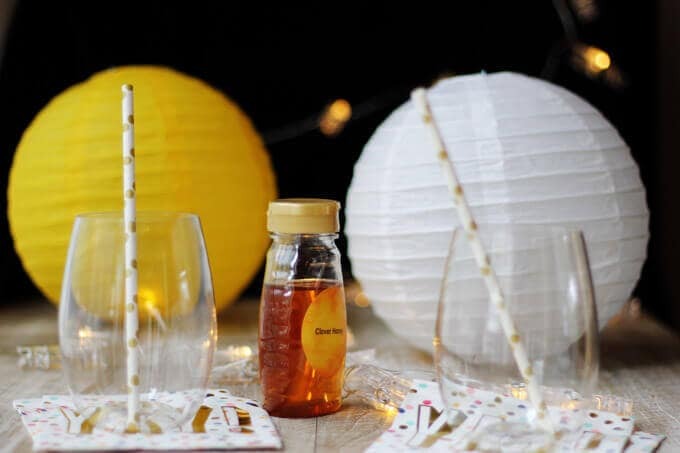 Set up some hanging lights, use colorful lanterns, decorative napkins and straws and you are all set. National Honey Board partnered up with Lifestyle Expert Camille Styles and provided me with this cool set for my dinner date night but you can use whatever you like to set the mood and enjoy your meal. Talking about the meal. 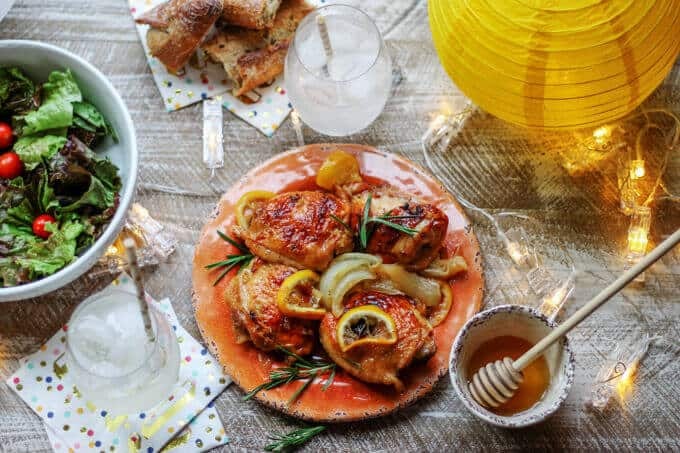 Trust me when I say that this Baked Honey Lemon Chicken with Garlic and Rosemary is out of this world delicious! It’s arguably the best chicken I’ve ever made. We couldn’t stop ourselves from indulging. And this sauce, made from honey, lemon and garlic, is beyond words. I suggest a crusty bread for this meal too so that you can dunk it into the sauce. You don’t want to miss any drop of that sauce…I promise you. As I said above, I like to have date nights in, but in order for this to make sense I can’t be standing in the kitchen the whole day and cooking only to be exhausted and not really feel like celebrating that night. That’s why for our date nights in I always go with a very simple meal. One which requires minimal work. 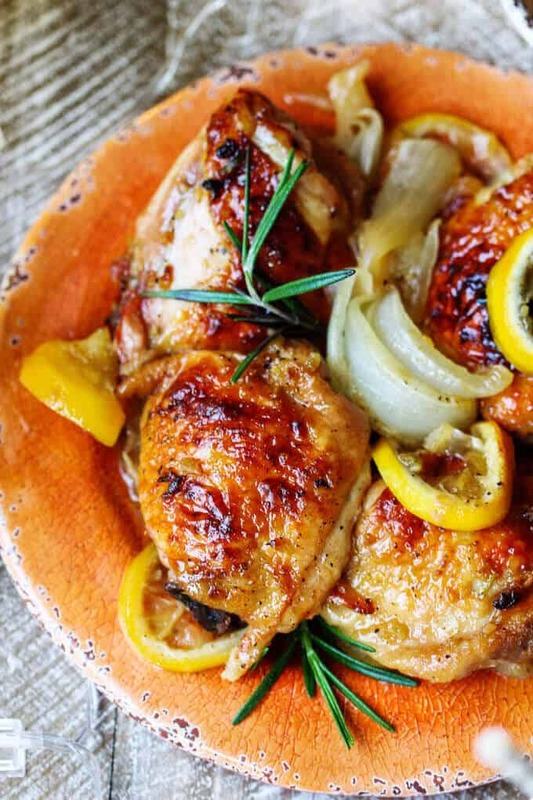 This Baked Honey Lemon Chicken is one such meal. It literally takes 10 minutes to prepare it and then the oven does most of the job. Because the sauce is so delicious, I suggest serving it with just crusty bread. As a side dish, I made a very simple salad with red lettuce and tomatoes. 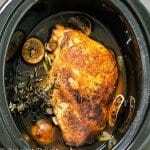 This chicken is very flavorful thanks to the honey, so you just need something crunchy and mild to accompany the main dish. It’s kind of a rustic meal, but I really do love these kinds of dinners. So again, your date night doesn’t have to be fancy and expensive. You can make it fun and delicious with a few simple ingredients and romantic set up. I can bet that a lot of people have all these ingredients right now in their fridge and pantry. Then you just mix the sauce, assemble the ingredients in either baking dish or cast iron skillet (affiliate link) and let the oven to the magic. 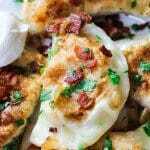 Scroll down for a full, printable recipe. 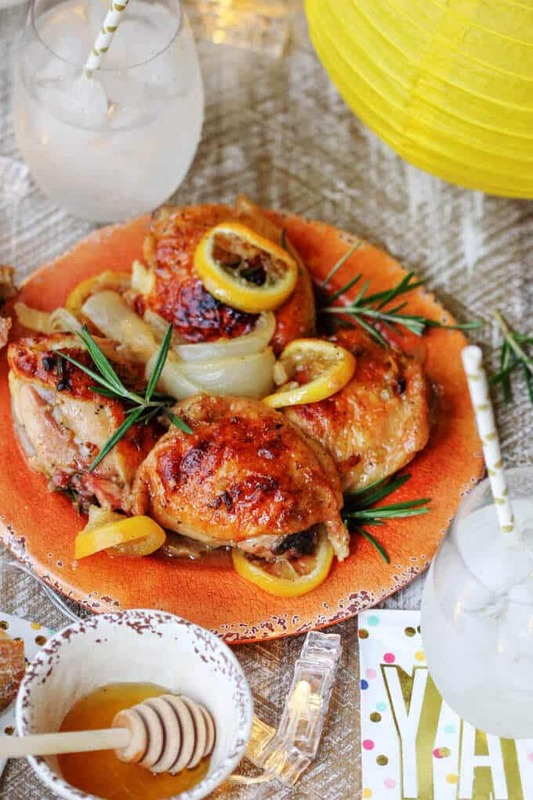 In a small baking dish or 9 inches cast iron skillet place quartered onions at the bottom, top with sliced lemon, rosemary strings and chicken tights. Few times during baking, baste the chicken with the sauce. Serve with crusty bread and side salad. Enjoy. This look amazing, I can’t believe how simple it is! 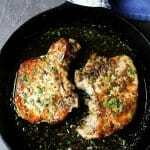 The chicken looks so juicy and tender, and it is pretty easy to make. Thanks for sharing. It is very easy to make. Thanks Nadja! This is making my mouth water.. 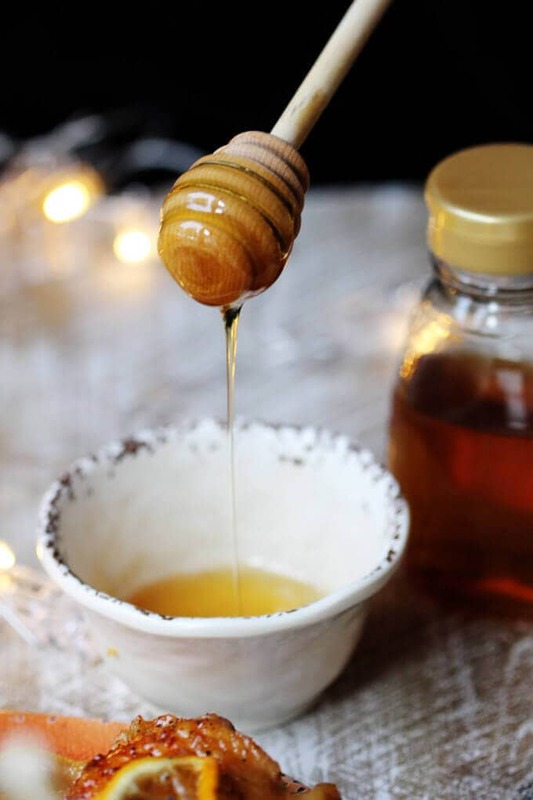 I love the honey picture because it reminds me of the honeycomb commercial but thanks for a great recipe! Two pluses in my life. Minimal work and date night. :0 Thanks!